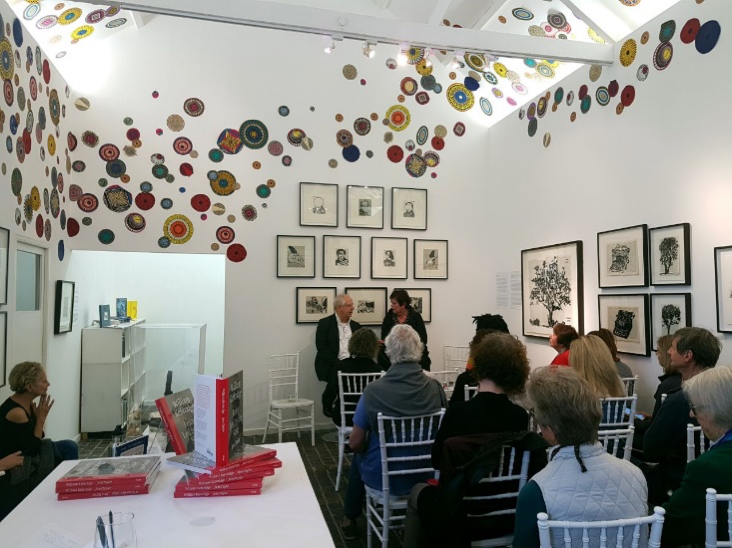 David Krut Projects Cape Town recently hosted Jane Taylor in conversation with William Kentridge on her latest published work William Kentridge Being Led by the Nose. Taylor, a long-time friend and collaborator with Kentridge has previously contributed to Ubu and the Truth Commission, and The Confessions of Zeno. Being Led by the Nose uses The Nose as a platform to discuss the link between Kentridge’s hand and mind, work and imagination. 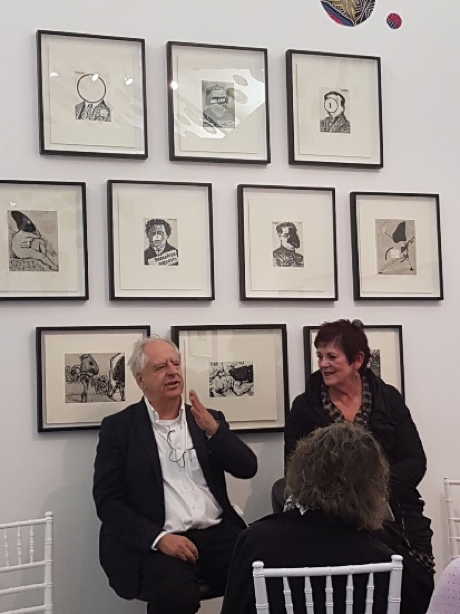 During the event the audience was treated to an inside discussion of Kentridge’s multidisciplinary practice and process of art making as well as a 30 second performance. The discussion occurred amongst the backdrop of the suite of thirty etchings from The Nose Series created in 2012 at David Krut Workshop in collaboration with Master Printer Jillian Ross. 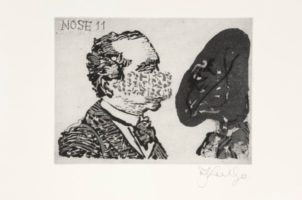 The Nose etchings relate to Kentridge’s production of the opera The Nose in 2010. Commissioned by the Metropolitan Opera House, New York to create a production of Dmitri Shostakovich’s satirical opera The Nose, William Kentridge set about creating maquettes, a miniature theatre, a series of giant nose sculptures and extraordinary backdrops in for the 2010 production. Shostakovich’s opera is based on one of the most famous stories in Russian literature, Nikolai Gogol’s The Nose, published in 1837. The story, a hilarious treatment of the folly of ambition and the banality of bureaucracy, follows the adventures of the pompous government official Kovalyov who wakes up one day to find that his nose has left his face and gone walking around St Petersburg. Kovalyov becomes more and more ridiculous in his attempts to retrieve his nose and his folly is treated with relish in Shostakovich’s colourful opera. 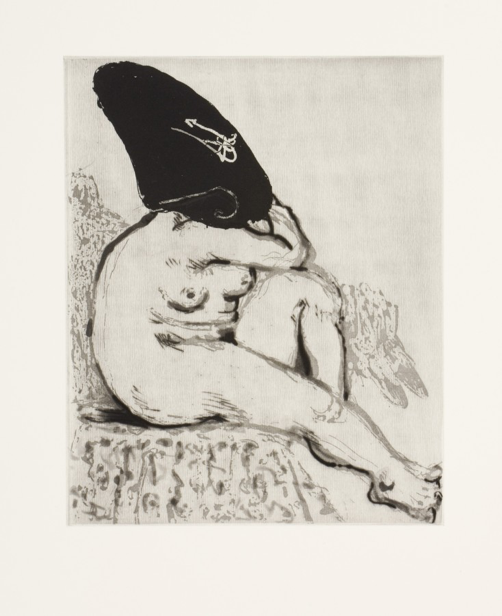 William Kentridge, ‘Odalisque’, 2010, Drypoint, spitbite and sugarlift aquatint. 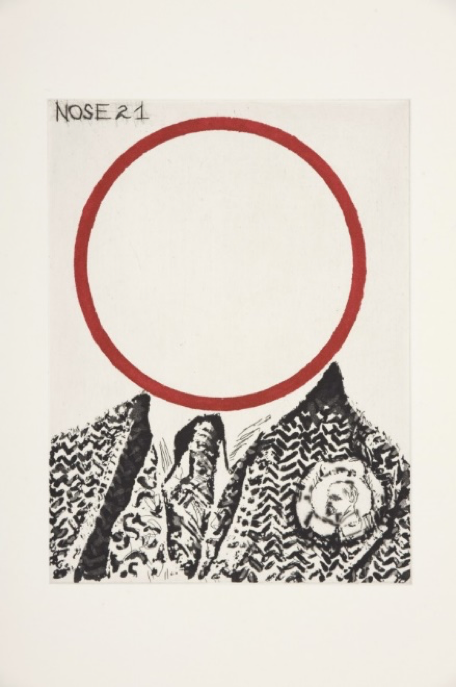 William Kentridge, ‘Nose 21’, 2009, Engraving and sugarlift aquatint. In his interpretation of Gogol and Shostakovich, Kentridge has projected the story forward to the period of the 1917 Russian revolution and the Russian avant-garde, and then even further into the twentieth century to include allusions to Stalin’s purges of the 1930s. But he has also cast his eye back to consider some of the literary influences on Gogol such as Lawrence Sterne’s Tristram Shandy and even Cervantes’s Don Quixote. Drawing on these and other texts, including excerpts from Russian newspapers, clips from Russian films of the ’20s and ’30s, pages of Russian encyclopaedias, and parts of a transcript of a meeting of the Central Committee of the Russian Communist Party in which the theoretician Nikolai Bukharin is being interrogated, Kentridge is piecing together not only his opera production but several other works. William Kentridge, ‘Nose 11’, 2010, Etching, drypoint and sugarlift aquatint. William Kentridge, ‘Mirror’, 2010, Burnishing, drypoint, etching and aquatint. The series of prints that emerges from this flurry of activity is a distillation of Kentridge’s thinking around the opera. 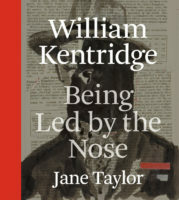 It shows Kentridge cheekily casting the eponymous nose as a character in a comedic adventure: the nose rides a horse, takes a lover, goes to the theatre. 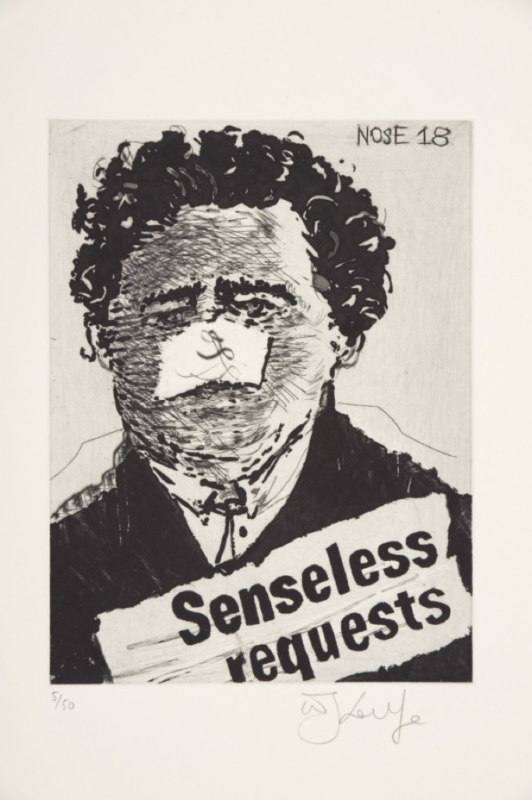 The suite of thirty etchings are featured in Being Led by the Nose which, alongside the etchings, is available at David Krut Projects, Cape Town and Johannesburg. To purchase Being Led by the Nose, you can visit the David Krut Bookstore here. William Kentridge, ‘Nose 18’, 2009, Drypoint, engraving, hardground, sugarlift aquatint.